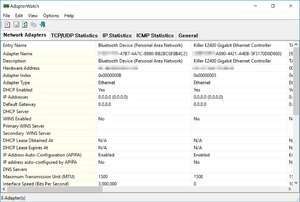 AdapterWatch displays useful information about your network adapters: IP addresses, Hardware address, WINS servers, DNS servers, MTU value, Number of bytes received or sent, The current transfer speed, and more. In addition, it displays general TCP/IP/UDP/ICMP statistics for your local PC. For security reasons, you should also check out the AdapterWatch download at LO4D.com which includes virus and malware tests. Additional screenshots of this application download may be available, too. AdapterWatch download been highly rated by our users.